Figure S6: The k-turn identified by DSSR in the SAM-I riboswitch (PDB id: 2gis). 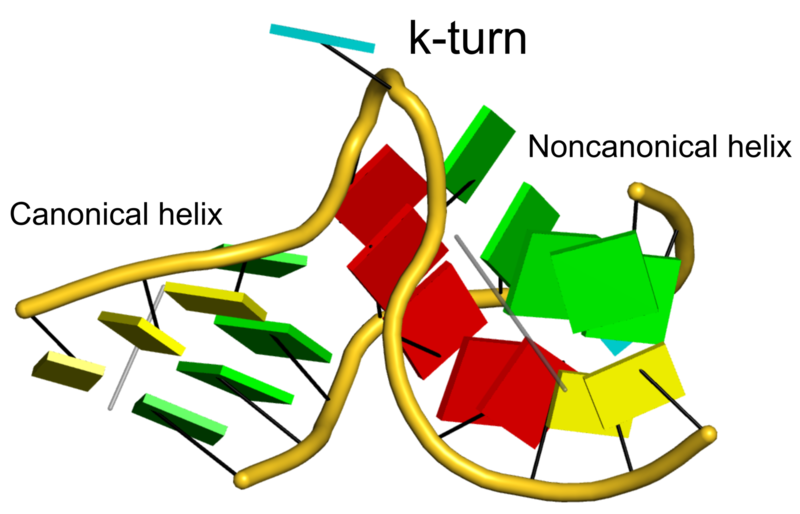 Base-stacking interactions are interrupted around the k-turn even though the backbone is continuous along each strand. Thus DSSR assigns two helices (depicted by gray lines), the canonical helix on the left, and the noncanonical one on the right. Starting from 2gis.pdb downloaded from the RCSB website, here is the complete script. The --helical-axis option outputs the best-fitted helical axes in file "dssr-helicalAxes.pdb". The --block-file option creates a .r3d file with bases (or Watson-Crick base pairs) in rectangular block represention. The png image was annotated using InkScape for the final illustration.